In this post, I cover three popular frameworks — React, Ember and jQuery — and dive into their latest happenings. What is React? Should I Use It? They also enforce component-based architecture. An encapsulated component in React should manage its own state and multiple components can be combined in your quest to build your app's UI. Below is a handy chart that compares some features of React vs. Angular. Source: Angular 2 vs React. What to Chose in 2017? In September, the React team announced the release of React v16.0 (and as noted above, have since advanced further)! Some long requested features/changes made it into the v16.0 release, including improved server-side rendering, error boundaries, support for custom DOM attributes and fragments. 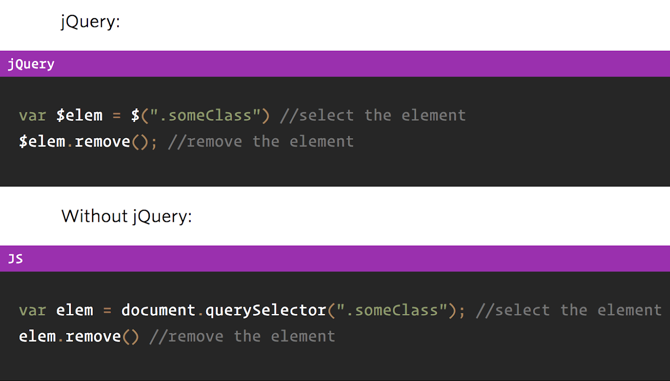 With the new return types for fragments and strings, you can now return an array of elements from a component's render method. Like with other arrays, you'll need to add a key to each element to avoid the key warning. 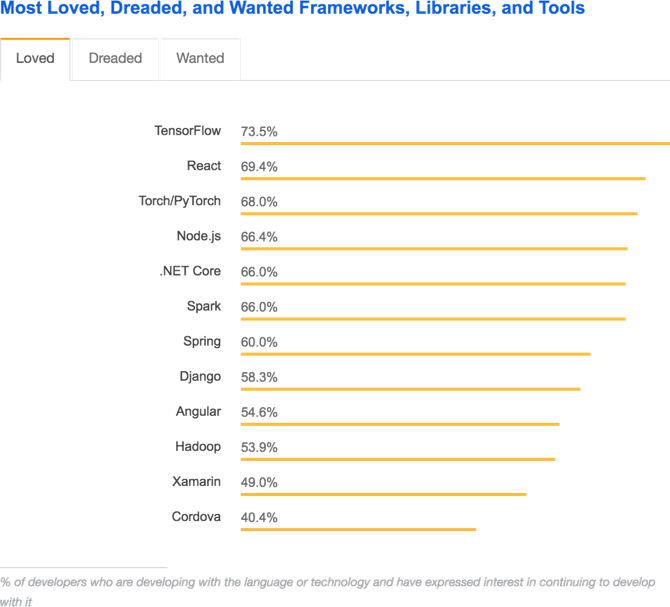 Editor's Note: This section has been updated to reflect the latest survey results from Stack Overflow. 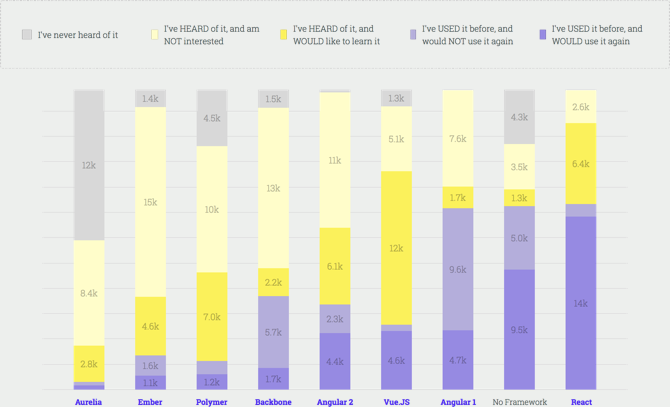 There really is no one way to know which frameworks are doing the best. This is just one peek into the enigma that is the web dev world. 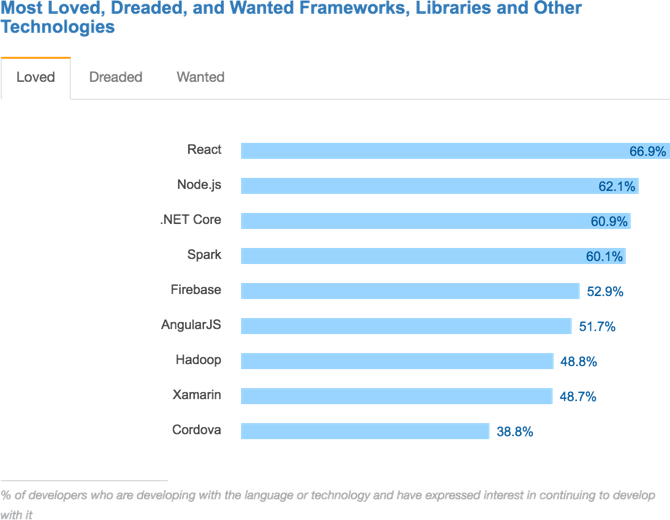 However, just going off of this pie chart, it still looks like Angular is on top, followed by React. 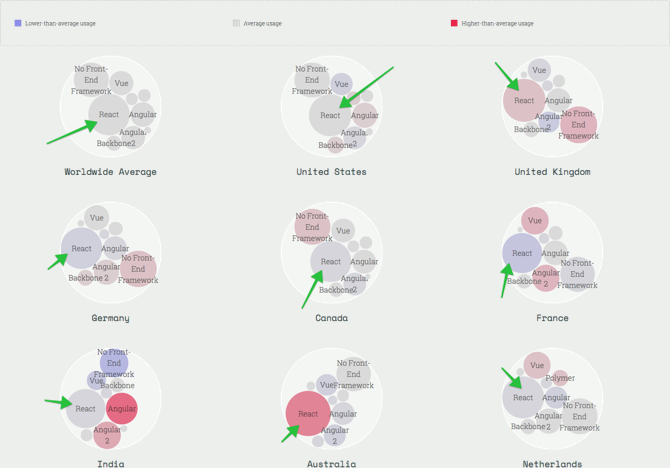 Whereas Ember doesn't even get a piece, its dataset is THAT small. Other surveys (see earlier) don't show Ember doing too well either. This does not mean that developers are done using Ember, it just means that the survey-taking-type devs are not in love with Ember right now. That's the thing about surveys, they only shed light on the part of the demographic willing to take them. Get a list of 31,099 websites using Ember which includes location information, hosting data, contact details, 15,116 currently live websites and 15,983 sites that used this technology previously. So, after interviewing him on his love of Ember, I understand a little more why it might be trending downward (at least on the scales we have to measure it today). 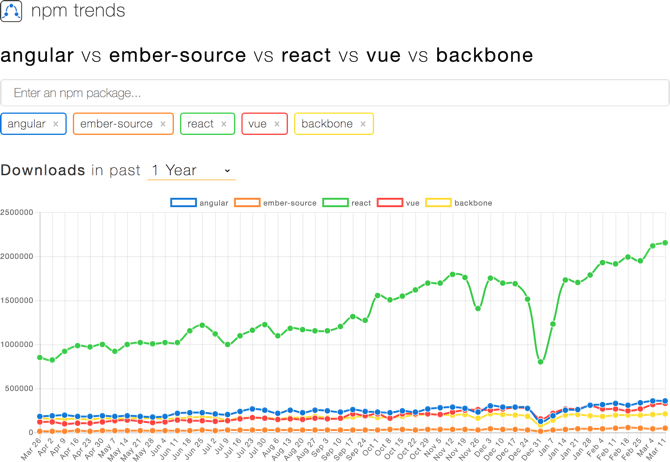 I predict that Ember, like Angular, isn't going anywhere. Whether or not it's popular in 2018, I can't say, but it will still be one of the forerunner frameworks. Ensure we get proper values for width and height on elements with display "inline". However, as a friend of mine likes to say "you might wanna take that with a bucket of salt", especially since jQuery has been around since the dawn of time. It would be very hard to imagine anything overthrowing that dynasty, anytime soon.